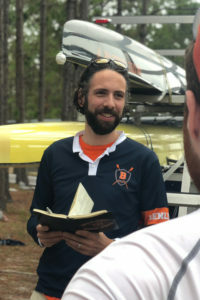 Dan has been at the helm of Bucknell Crew since the Fall of 2014. Under his guidance the Bison crews have won multiple MARC Conference, NIRC and ACRA National Championship medals. Dan has been at Bucknell for over 10 years, as he came to Bucknell Crew after seven years with the Bucknell Women’s rowing program. While working with the women’s program, he amassed gold medals at the Murphy Cup, Dad Vails, ECACs, Patriot Leagues and individual sprint races. During that time he was recongized as the CRCA Mid-Atlantic Region Assistant Coach of the year three times, and in 2012 was named the National Assistant Coach of the Year. Dan was an accomplished rower at Fordham University, where he graduated in 2004. He was inducted into the school’s Athletic Hall of Fame in 2012. The two-year team captain helped lead the Rams to three Dad Vail Regatta gold medals, one ECAC National Championship varsity lightweight eight gold, and two top six finishes at the IRA Regatta. Following graduation, Dan spent three years coaching at his alma mater, Fordham University, as well as acting as the head coach for Fordham Prep School each spring and the Pelham Community Rowing Association junior men each summer. Francis, a 2014 (undergrad) and 2017 (grad) graduate from St. Lawrence University, joined the Bucknell Men’s team staff in the Fall of 2017 after spending two years as an assistant coach at St. Lawrence University. At St. Lawrence, he worked primarily with the men’s freshmen squad, while also serving as the men’s recruiting coordinator. During that time, he also was a key component in fundraising $200k for an indoor rowing tank at St. Lawrence. From 2009-2014 Francis rowed at St. Lawrence University after joining the team as a walk on and helped lead his Novice 8 to a Liberty League Championship Final during his freshman year. He moved on to spend the rest of his rowing career in the Varsity 8, leading them to many victories and finals over rival teams.